Oak cut on end to show the annual rings of the timber. Origins for this product date back to the 19th and 20th centuary where blocks were used in affulent areas within the cities across European and American as a quieter alternative to Granite paving for horse and carriage. A study was carried out in the late 1900’s that concluded that a horse could travel over 440 miles on wood blocks against 130 miles on granite blocks without falling. Variousy Species including creosoted Norwegian Pine we used reducing cost increasing the areas where this was laid. Shock absorbtion qualities together with the exceptionally hard wearing qualities of end grain timber have seem this floors type being used in many engineering firms including Formula 1 race teams. 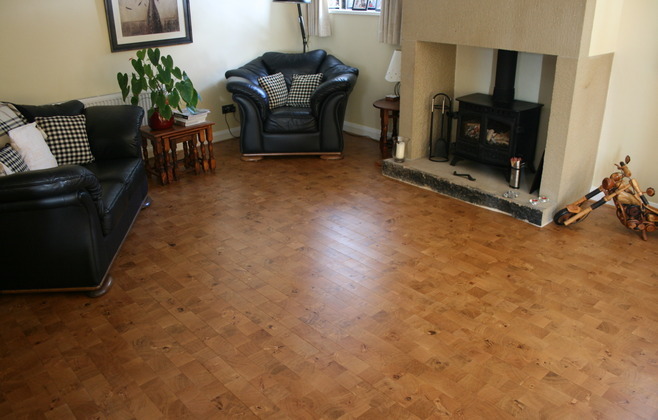 Offering a totally unique looking floor today End grain can be supplied in a variety of Species Oak being the most popular as shown here.